Ray Kurzweil spoke at the Coolige Theater last night. Kurzweil, an inventor and transhumanist, was promoting a forthcoming movie based on his book The Singularity is Near. Which singularity would that be? We went home with a copy of The Age of Spiritual Machines and the new book on his health regimen, Transcend: Nine Steps to Living Well Forever. (He means "forever" literally.) 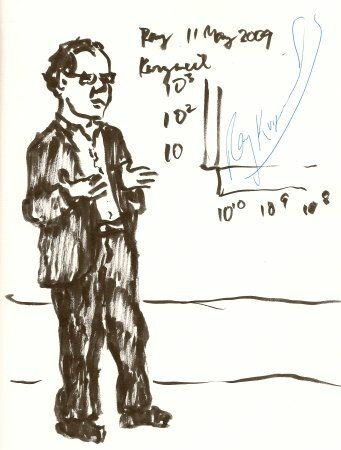 He also kindly signed the drawing of him in my sketchbook, written along the logarithmic progression that information technologies across all disciplines are taking, putting stunning developments within the reach of the next two decades. The visual arts lie in between the musical arts and literary arts in terms of the impact of computers. A great deal of visual art is created using paint and illustrator programs, which can simulate the effects of conventional materials such as paint strokes as well as implement a wide range of techniques that could only be executed on a computer. Recently, computers have also taken over most video and film editing. The Web is filled with the artistic musings of cybernetic artists. A popular technique is the evolutionary algorithm, which allows the computer to evolve a picture by redoing it hundreds or thousands of times. He goes on to site Harold Cohen, whose AARON program was supported by Kurzweil CyberArt Technologies. It looks like a dead project. Cohen doesn't seem to be active and I'm not sure if he's alive. You can find AARON's work around on the Web. The high quality of computer screens, and the facilities of computer-assisted visual rendering software, have made the computer screen a medium of choice for visual art. Most visual art is the result of a collaboration between human artists and their intelligent art software. Virtual paintings—high-resolution wall-hung displays—have become popular. Rather than always displaying the same work of art, as with a conventional painting or poster, these virtual paintings can change the displayed work at the user's verbal command, or can cycle through collections of art. The displayed artwork can be works by human artists or original art created in real time by cybernetic art software. Visual artists in all of the arts are emerging and are taken seriously. These cybernetic visual artists, musicians, and authors are usually affiliated with humans or organizations (which in turn are comprised of collaborations of humans and machines) that have contributed to their knowledge base and techniques. However, interest in the output of these creative machines has gone beyond the mere novelty of machines being creative. Visual, musical, and literary art created by human artists typically involve a collaboration between human and machine intelligence. The type of artistic and entertainment product in greatest demand (as measured by revenue generated) continues to be virtual-experience software, which ranges from simulations of "real" experiences to abstract environments with little or no corollary in the physical world. Maybe, maybe not. Again, I see design going here far in advance of fine art. I think that as long as we have bodies, we're going to want to have aesthetic objects around us made of the brute matter that we're made of. Once our minds are fully uploaded into the machine, maybe that will change. But even then, I think that for a long time we'll desire the highest-resolution representations of paper, paint, cloth, stone, and metal for our art objects, to remind of the pleasure of touching such things with our hands, back when we had them. The idea behind Darpa’s latest venture, called “Physical Intelligence” (PI) is to prove, mathematically, that the human mind is nothing more than parts and energy. In other words, all brain activities — reasoning, emoting, processing sights and smells — derive from physical mechanisms at work, acting according to the principles of “thermodynamics in open systems.” Thermodynamics is founded on the conversion of energy into work and heat within a system (which could be anything from a test-tube solution to a planet). The processes can be summed up in formalized equations and laws, which are then used to describe how systems react to changes in their surroundings. Now, the military wants a new equation: one that explains the human mind as a thermodynamic system. Once that’s done, they’re asking for “abiotic, self-organizing electronic and chemical systems” that display the PI principles. More than just computers that think, Darpa wants to re-envision how thought works — and then design computers whose thought processes are governed by the same laws as our own.